Since 1902, Physicians Mutual Family has been in service for independent folks who realize the importance of working hard in order to provide for their families and secure their future. Determined to make a difference in the world and make a change for the better, Physicians Mutual strives for customer satisfaction by offering solutions that precisely cater to the needs of the working class. The business keeps things simple and transparent with clients and is all about listening to their situation instead of forcing them to go in a certain direction.The company’s portfolio includes medical supplements, funeral pre-planning, life, dental and accident insurance, supplement health plans and other annuities. It especially works towards simplifying the daunting procedure of Medicare Supplement Insurance coverage and helps clients pick a plan that is right for them. For this purpose, Physicians Mutual offers various options that not only take into consideration the client’s needs but also their financial capability. Known for their history of financial strength, excellent customer service, and reliability, Physicians Mutual is a choice of many. Depending on where you live, they offer Medicare Supplement plans F, G and N where the premiums vary according to the amount of coverage provided by each plan. This plan provides extensive coverage for all the basic benefits, which includes 100% Part B Coinsurance. In this plan, all deductibles and foreign travel emergency coverage are included. There is also a sub-option known as a High Deductible Plan (HDF), which is the same as your regular Plan F after you have paid an annual deductible of $2,180. The best part about Plan F is you don’t have to bear any out of pocket expenses. Plan F used to be a much more popular option before many carriers offered Plan G.
Now that lots of companies offer Plan G, there is much more competition over price, making the G plan much more affordable. 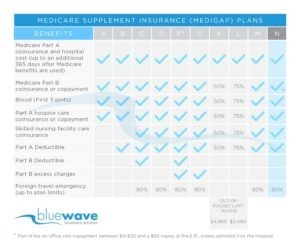 This Medicare Supplement Plan has features and terms similar to that of Plan F, except there is only Part B deductible. This deductible is $185 in 2019. Part B excess in included 100% and foreign emergency is also allowed. 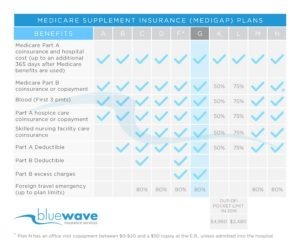 Plan G is the most popular plan for folks buying a Medicare Supplement plan. The reason this plan is so popular is that the premium savings you get on Plan G more than covers the $183 annual deductible. For example, a 65-year-old non-smoker is quoted at $160 per month for Plan F and $120 per month for Plan G.
The monthly premium difference is $45 per month or $540 for the year. This is much more than the $185 annual deductible. This person would actually save $357 on Plan G. ($540-$183). 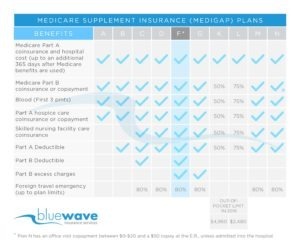 This Medicare Supplement plan covers all the basic benefits, just like the other two plans and includes 100% Part B Coinsurance. The only difference is the Coinsurance is covered up to an amount of $20 co-payment for Office, and around $50 for an emergency room. This plan also covers the Part A deductible and allows foreign emergency travel. All the plans include skilled nursing facility coinsurance and offer clients significantly superior coverage in comparison to other plans.